Based on our September 2006 presentation / display at the CGS UK AGM in Dudley, England. Firstly, an enormous “thank you” to all the CGS collectors who made the magnificent Brockwitz display so unique and utterly show-stopping. Sincere and heartfelt thanks to everyone who helped and contributed. It was undoubtedly a World First. It was impressive, comprehensive and educational. Quite frankly it was mesmerising and absolutely mind-blowing. But most of all it was simply beautiful. 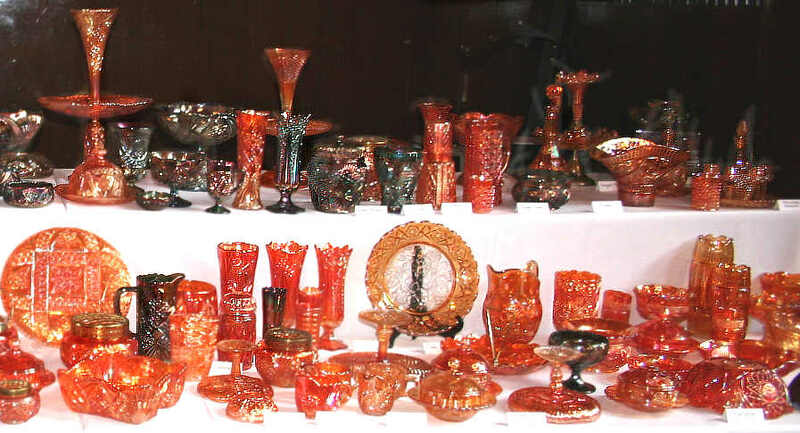 There were almost 150 pieces of glass and approaching 40 different patterns shown in the display, including some that we hadn’t even seen before. ​That’s what is so fascinating about Brockwitz - previously unknown shapes and patterns still turn up. Here is the display - we have split the picture into two halves to show it here - the central point of the display is the Curved Star epergne, which is in both shots. The top photo is the left side of the display, while the lower photo shows right hand side. 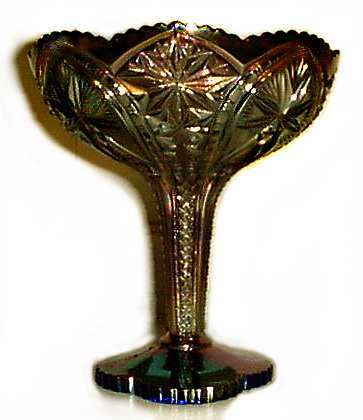 At the time of the presentation, it was almost 20 years to the very month, since the (late) Raymond Notley first put the name Brockwitz into the Carnival glass vocabulary. Since then there has been an enormous amount of research and discovery. In the early 1990s, we worked with glass researcher, Bob Smith and were able to document many Brockwitz patterns and shapes, through the catalogues that Bob had sourced. We then worked with Siegmar Gieselberger in Germany, and even more catalogues appeared for study, courtesy of Dieter Neumann. Today we have an almost unimaginable resource of information at our fingertips - and still fresh items continue to be discovered. On the right are some of the exceptional of Brockwitz Carnival that was on display. Diamond File Panels tumble-up, marigold. All the above pictures of the display were taken at the event by Stephen Thistlewood. Peter Phillips attended the presentation on Brockwitz, where he showed us a photo of a magnificent Tartan vase. Peter had travelled from Australia (via the USA) to attend, so it was understandable that it was just a photo he showed us rather than the actual item. Nevertheless we drooled over it, and Peter promised to send us a photo we could share with our readers on this website - here it is on the right. Many thanks to Peter for this opportunity. Peter also took the photo of the amazing three part Tartan epergne, far right, which is owned by Margaret Dickinson in Australia - we're grateful to Margaret and Peter Phillips for sending it to us for inclusion in this Brockwitz feature. The picture was taken looking upward, as the epergne is on a high shelf, and hence the very bottom part of the base is out of the shot. As you can see, the pattern is on the underside of the central section and can be best seen from this aspect. Both picures are courtesy and copyright of Peter Phillps. 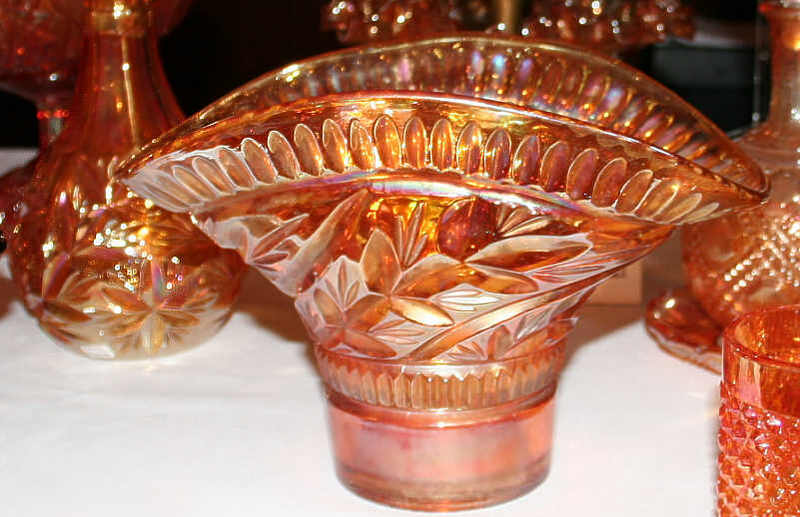 On the right are two photos (to illustrate the two different types of star motif) of the Brockwitz Cathedral Arches stemmed fruit dish (often called a comport). This magnificent item, standing around 9" high, was in the Brockwitz catalogues during the 1920s and is known in marigold and blue. Only a handful of these rare items have been reported. This beauty was not on display at the Brilliant Brockwitz presentation as the owners (Mary and Doug Ellis) didn't actually have it. It was an early 2007 "find" and (courtesy of these photos by David Johnson) we are delighted to feature it here. The pictures are courtesy and copyright of D & M Ellis and D & E Johnson.